Every mom wants her daughter to have the best day on her wedding day and I am very confident Rachel did. Everyone felt the love and joy and had a wonderful, lovely, fun, laughter-filled – yes, even excellent – time. A week after the wedding they still have that after-wedding glow. (Pretty good since they’ve been together for eleven years – high school sweethearts!) Sigh. I have to add I was quite proud when I realized Rach was using spreadsheets to plan her special day. Yep, that’s my girl! I did my share of planning for the care of Robert and our pets since we would be out of town for a few days for the wedding. We used pet sitters referred by a friend and introduced all the animals to them several times before we left. I labeled all the cupboards with post-it notes, labeled the medications and supplements and also created an “About” document for each dog (and even the turtle!). The staff at Peaceful Pets was amazing! The two sitters who visited and stayed with our babies sent photos and an update every day and I was so thrilled (and a little amazed) there were no issues – just lots of loving care. Planning for Robert’s respite care started last fall. Since Robert is a client of the local Regional Center, we get 14 days of respite care per year. In reality, we haven’t had a respite day in two years. Robert’s case worker tells me that finding a care home to temporarily take a male, mostly non-mobile client (Robert needs assistance if walking with a walker and when transferring from his wheelchair) is pretty much impossible. I accepted that and realize I am luckier than many since Robert has a terrific day program to go to during the day while I am at work. 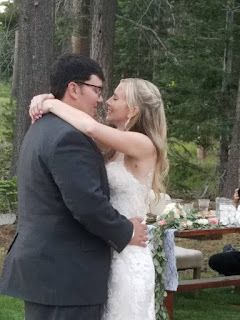 However, I really wanted to spend a few days (and a few overnights) of non-caregiving time to help Rach with the last minute details of her wedding and to fully enjoy and experience this important life event. I felt a little guilty not including Robert but I knew he would be just as happy hearing about the wedding and seeing the pictures. Those who know Robert know this to be true. So last fall, I asked Robert’s case worker to please find a place for him for five nights. I chose the facility that Robert is familiar with and where he stayed after his hospital stay three years ago. He received good care then and I thought the familiarity of the facility would result in a successful respite stay. I wanted Robert to be happy and well-cared for and ready for some wedding stories when he came home. In preparation for Robert’s stay, one of his neurologists wrote an order for a respite stay. I sent her Robert’s medication list and schedule which she included with her order. I called to confirm the orders had been received and confirmed the dates of respite. The admissions director was pleasant and assured me everything was ready for Robert. We discussed the time of day to drop him off since I didn’t want to bring him during a busy time, such as a shift change. I updated my “About Robert” document which explains how he needs help dressing and bathing, what his seizures look like, his incontinence as well as his little quirks and his love for Rocky Road ice cream (I always like to throw that in since it is so important to Robert). I now wonder if I stressed enough how much assistance he needs when transferring from his wheelchair. I thought I was clear but doubt is creeping in. When it came time for respite, I loaded the car with incontinent supplies, Robert’s suitcase, walker, razor and toothpaste and, of course, his word search book (and an extra one, just in case). I took Robert in and met the nurse and the CNA. They asked me if I had the admissions packet. Um, no. I don’t even know what that is. What hospital did he come from? Hmm. They sounded confused at first then assured me they knew Robert was coming but explained there was usually an admission packet. I told them I didn’t have that but I gave them a copy of the medication chart/schedule as well as his “About Robert” document. Before I could bring in the rest of his supplies, Robert needed to use the restroom. I took this opportunity to show the CNA just how much assistance Robert needs to transfer to the toilet. She was grateful I was showing her what we did at home. She also said she would read the “About Robert” document and would be with Robert during the morning shift the next few days. After getting Robert settled and making sure the nurse had the medication schedule, I left while Robert ate lunch. Robert was happy and enjoyed meeting the nurse and CNA. Later that afternoon, I received three calls from the facility about various admission questions and paperwork. They wanted me to return to sign some documents. (You know, I was just there!) I explained I was getting ready to go out of town and could not come back to sign any paperwork. The rep seemed satisfied with that and said we could handle everything when I picked Robert up on Monday. I received another call the next day with the same questions. Different rep, same questions. Goodness, people! Get it together! I gave her the same explanation and she said that was fine. I asked how Robert was doing and she checked on him for me. She called me back to say he was doing great. At noon on Friday, I received a voicemail to call the facility. I called back and was told Robert was “found on the floor” of his bathroom with all of his clothes off. What do you mean “found on the floor?” Wasn’t someone with him? Apparently not. The nurse explained that Robert wheeled himself to his room and then went to the bathroom by himself. My first question was if he was wearing his helmet (phew - he was) and if he was hurt (they said he wasn’t). The nurse said they would check vitals every 15 minutes to be sure he was okay. I stressed (and I mean stressed) that he cannot go to the bathroom by himself. HE NEEDS ASSISTANCE! The nurse said he completely understood and was very apologetic. I tried calling the facility seven times on Saturday (wedding day!!) but we were in the mountains and service was sketchy. (I found myself doing what a friend who lives in a rural area of Arkansas does – holding my arms out above my head in search of service.) No luck. Just before 10:00 p.m. (and during the wedding reception!) I glanced at my phone and saw a missed call from the facility from a couple of hours earlier. Well, crap. This can’t be good. I was able to use a land line and got through to the facility. The person who you were told needs assistance was left to his own devices and fell. I can understand an accident (heck, Robert has fallen in our care before. Accidents do happen.) To me, this wasn’t an accident – this was from people not paying attention. I left these people in charge of Robert’s care and expected him to be returned in the same shape as I left him. I had planned to pick Robert up on Monday but we got back into town mid-afternoon on Sunday so I decided to pick him up early. I really couldn’t risk Robert falling a third day in a row. I called the facility to inform them I would pick Robert up in about an hour. The nurse was resistant to me doing so and told me she had to call the on-call doctor or would have to mark Robert as leaving “against medical advice.” She then told me if that happened she couldn’t release his medications to me. What the heck? I told her I would be there to pick him up and to do what she could to get Robert released. This was the same nurse who called me the night before about the fall and I reminded her why I was picking him up early. By the time I got to the facility, everything was set for his release. The CNA had packed up his belongings and the nurse gave me his medications. I asked for their medication schedule so I knew what he had taken so far that day. There was a great deal of consternation about providing that to me since there were nurses’ names on the schedule. They finally were able to print out a list of the medications and when they were supposed to have been administered. I reviewed the list before I left the facility and realized they completely changed the medication schedule that I (and the doctor) had given them! The two medications that have to be taken with meals were not given with meals at all. The bedtime dose of Zonegran had been switched to the morning which made no sense! If I hadn’t asked what he had been given that day, I would have doubled his dose of Zonegran for the day! Of course, the switch in the medication schedule very well could have contributed to his falls – who knows if a seizure made him fall or if the change in medication made his balance even worse than it already is! On top of the revised schedule, they ordered extra medication for two of his prescriptions. I gave them enough medication for the respite stay plus an extra day as a back-up. They didn’t need to order more meds! I asked if this was going to cause an issue with his regular prescription schedule and the nurse said she didn’t know. The CNA chimed in that I should take the medications just in case it does. I took it but don’t know why it was ordered in the first place. It was completely unnecessary. As I was checking the medications to be sure they returned all of them to me, the nurse told me that Robert had a small bruise on his right hip. We finally left and it was time to get Robert into bed by the time we got home. I changed him and that is when I saw his bruise. It was larger than the size of a softball and very dark and green. I then noticed a scrape on the back of his leg and another bruise under his right arm. A small bruise?! Not even close. Thankfully, Robert didn’t remember falling and has a very high pain tolerance. Nothing hurt him at all. Robert did not remember anything about the facility except they had great food. I am so very grateful for this small miracle. 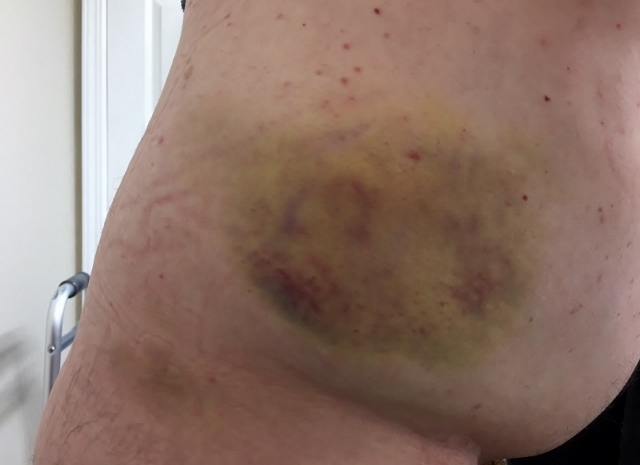 I worried about the bruise, though, since it looked so terrible and I made an appointment with his primary doctor the next day. She was kind enough to get us in even though it meant double-booking an appointment. She examined all of his bruises and the scrape and told us to ice the hip bruise. She said it was in the general area of the liver and gave me signs to watch for that would indicate a liver problem. I couldn’t believe how serious this could be! After the appointment, I called the admissions director and told him I had just come from the doctor with Robert. He knew nothing about any of the falls but was very apologetic. I asked for the fall reports and a refund. He said he would definitely bump my concerns up to his “team” and would call me back. When he hadn’t yet called me by mid-day on Tuesday, I called him. He promised the fall reports but said they needed to be retrieved from the medical records department. He also said he couldn’t give me a refund. I reminded him that Robert came home in worse shape than he went in and he apologized but he couldn’t get the refund approved. I next left a message for the facility director who never called me back. Late that afternoon, the admissions director called me back to say the reports were coming “soon” and that I would get a refund after all. Hmm. I’ll believe it when I see it (which I haven’t at this writing). It took two more days to get the fall reports (which indicated “no injury” with regards to both falls!). I understand that bruising can show up after a day or two but the nurse TOLD me about the bruise. She had to have seen how big it was and yet there was no mention of it in the reports. I was absolutely livid. How could the care be so bad in such a short period of time? Of course, I did what I usually do (and what many caregivers do): wonder how I could have done things differently in order to get a better result. Better instructions? More phone calls? Maybe with Robert’s cognitive issues he shouldn’t be in a skilled facility? Ugh. No. I had to stop. I prepared for this. I told them Robert needed assistance (and certainly stressed it after the first fall). This was not my fault. I filed a report with the licensing agency for this facility and notified them about the falls and medication issues. My hope is that the investigation results in better care for others in the facility. Thankfully, Robert’s bruises and scrape are healing and there does not appear to be any liver damage. His seizures haven’t increased due to the medication incompetence (and, thankfully, I didn’t overdose him when I brought him home). Things could have been much, much worse and since sharing this experience I have heard from several people who did have much worse experiences when leaving their relatives in the care of a skilled facility. A few had horrific experiences. I understand many of these facilities are understaffed so I actually do not blame the nurses or the CNAs. I really think they try to do their best (except the nurses who change medication schedules. Those nurses I do blame!!). The reason I filed a complaint is not to get the staff in trouble but in order to make sure the administration sees there are problems and, hopefully, decide to increase staffing ratios or make other changes so no one else suffers because of neglect or lack of resources. Those of us who can advocate for better care must do so not only for our own loved ones but for those who cannot speak for themselves. Most of the residents of a skilled facility are in no position to advocate for themselves and many of them do not have someone who can advocate for them. The fighter in me also believes in advocacy and tenacity and I promise I will not stop insisting on quality care for not only Robert but others like him. We all deserve love and we all deserve the best possible care when we cannot provide it for ourselves. I will keep you posted on the investigation but, in the meantime, please share your own Skilled Nursing Facility experiences (good or bad).